Super quick and tasty – this taco tastic pizza will have your taste buds tingling! 1. Preheat the oven to 220 ºC (200 ºC for fan assisted ovens), gas mark 7. Place each pizza base onto a baking tray. In a medium bowl, stir the passata, taco seasoning and chicken together. 2. Spoon the chicken mixture over each pizza base, leaving a 2-3 cm border. Top with the cheeses then bake in the oven for 8-10 minutes or until the cheese is melted. 3. Drop spoonfuls of the soured cream over the pizzas. Top with the lettuce, tomato, tortilla chips and olives. Cut each pizza into wedges to serve. 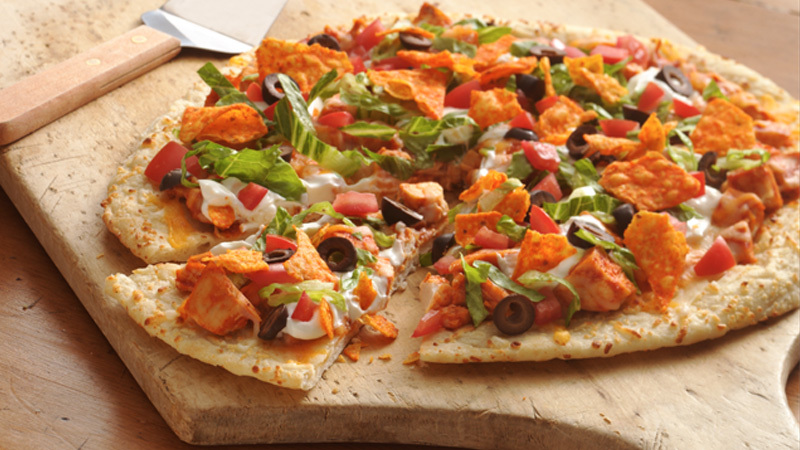 Make this pizza your own by topping it with your favourite taco toppers. Try sliced olives, chopped avocado, fresh coriander or sliced jalapeños.